The QLA® Write-On/Wash-Off A-Frame Sidewalk Sign with marker board. The A-frame signs channel will accept virtually any substrate 24" x 36" x 4 mm (3/16 inch) which allows the sign panels to be changed out quickly. The "EZ Lock-in" provides additional security. The sign face is curved to deflect winds up to 30 miles per hour. One of two uprighte is wheeled allowing the Tip 'n Roll feature makes the sign easy to move without lifting. Great in rainy wet weather! 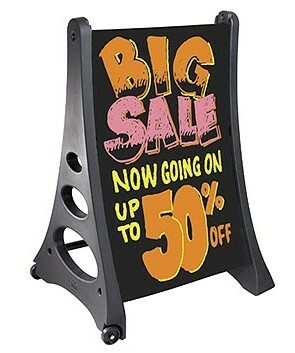 2 - Black Write-On/Wash-Off Sign Panels or faces.